A view of Fredom Plaza from Bike to Work Day 2006. Photo by randomduck. It’s still not too late to participate in Bike to Work Day. Some of the pit stops for bike commuters in Washington, D.C., in neighborhoods like Columbia Heights, will still be offering a local mix of food, drinks, entertainment, dynamic speakers and chances to win prizes in the afternoon—on your way back from work. Don’t forget to register on Washington Area Bicyclist Association’s website and check the pit stops en route back to your home or happy hour destination. According to Twitter’s trending hashtag #DCBikeToWork, this morning’s pit stops were a success with great turnouts at Freedom Plaza, and probably other popular spots like Capitol Hill and Farragut Square. Did you ride your bike to work today? If not, will you ride your bike back home? Tell us in the comments section what inspired you to bike to work, or conversely, what holds you back from commuting by bike. 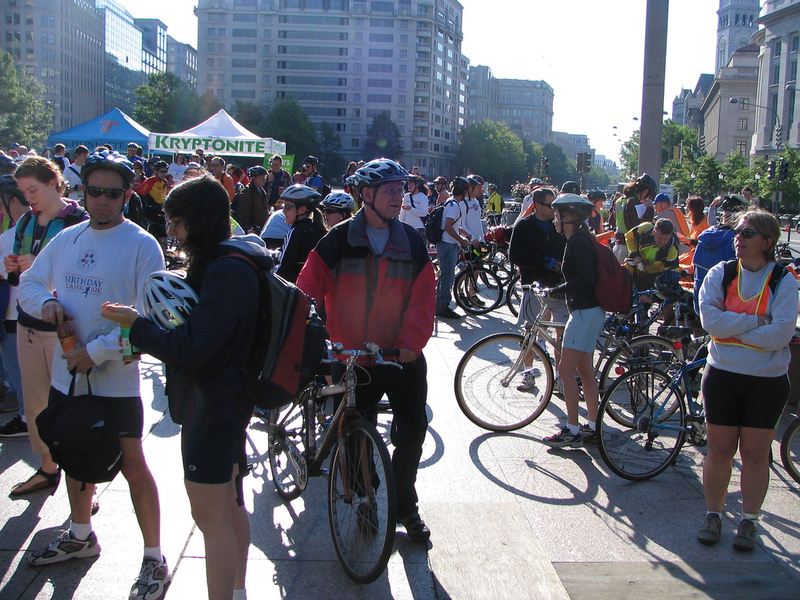 Tags: Bike to Work, cycling, North America, United States, Washington, D.C.